Ten years after the Great Recession, Orange County’s housing market still hasn’t fully recovered. Home sales volume remains low, as does job creation. 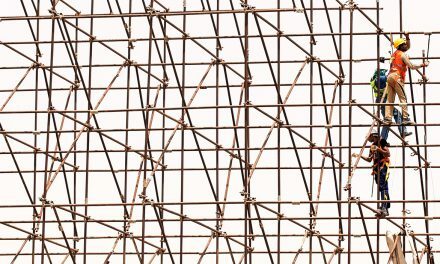 Residential construction of all types continues to struggle in this region, leaving would-be homebuyers wanting for more. As the next recession looms on the horizon — expected in 2020 — forward-looking agents will prepare for the slowdown in sales and prices to continue here in Orange County and across the state. The next 30 years are going to be an about-face of the past 30 years of repetitively declining mortgage rates. Homebuyers will face the pressure of these rising rates in the coming years, though a brief reprieve is to be had in 2019-2020 as the Federal Reserve allows rates to cool in preparation for the next recession. 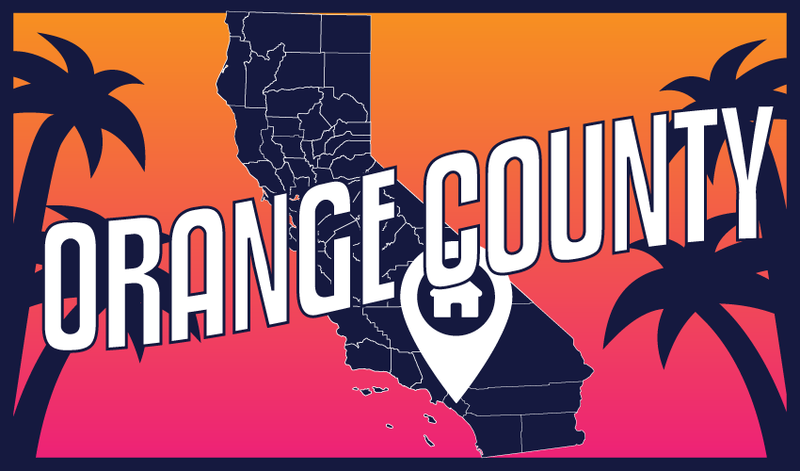 View the Orange County regional charts below for details on current activity and forecasts for its local housing market. Home sales volume in Orange County remains weak and somewhat stuck at just over half the heights seen during the Millennium Boom. Echoing state trends, Orange County saw a decrease in total home sales volume in 2018, ending the year 9% lower than in 2017. In contrast, approximately 500 more sales took place in 2017 than 2016, amounting to a marginal increase of 1%. A sharp bounce in home pricing following the speculator interference of 2012-2014 has held sales volume back from any significant increases. Buyers’ incomes, already insufficient to keep up with quickly rising home prices, were further decimated in 2018 as mortgage interest rates increased. 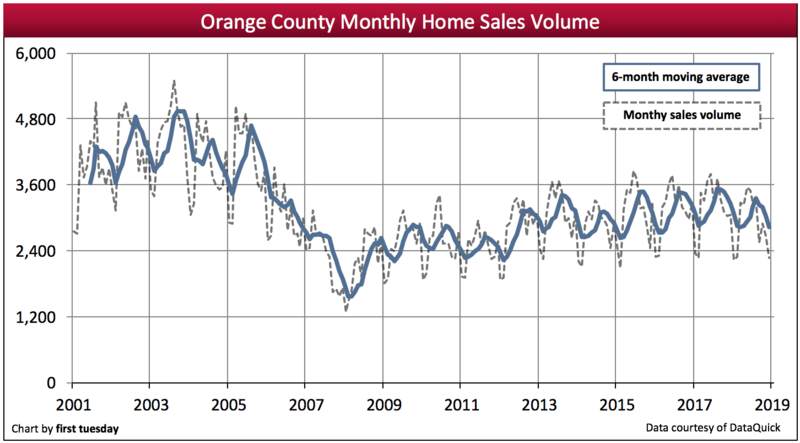 In review, 2009-2010 Orange County sales volume rose slightly with the introduction of the housing tax credit, falling back in 2011 for lack of end user demand. From the latter half of 2012 through most of 2013, speculator hyper-activity bumped sales volume artificially yet again, as it did in all of California. The speculator buying wave has since receded. Looking forward, a complete recovery with annual sales volume of around 46,000 in Orange County will be reached only after end user demand is buttressed by labor force participation and normalized job levels, expected in the 2021-2023 recovery period following the next recession, anticipated by economists to arrive around 2020. Without turnover, homes do not sell. The homeowner turnover rate in Orange County has remained mostly level since the end of the recession in 2009. The renter turnover rate has declined since 2010 and was at 17.8% in 2017, the most recently reported Census year. Renters rose at a more gradual pace in 2018, following years of escalating rents and declining rental vacancies. Homeowners are likewise struggling to compete with other homebuyers for a shrunken inventory of homes for sale, meaning the turnover rate remains relatively low today. Turnover rates are likely to rise dramatically in the convergent 2021-2022 boomlet period raising rental vacancy rates. Then, members of Generation Y (Gen Y) will collectively rush to buy and Baby Boomers (Boomers) will retire en masse, selling and mostly buying replacement homes. International and domestic emigration into California will also play a significant role in suburban housing demand. 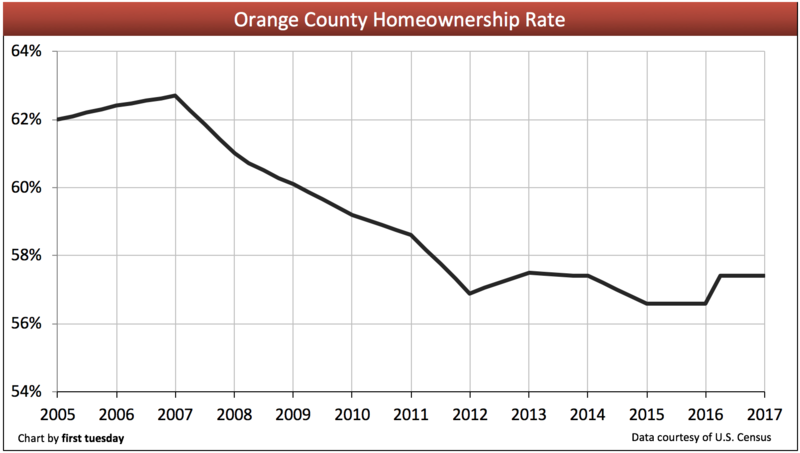 Orange County’s homeownership rate has fallen since its 2007 peak of 62.7%. The most recent homeownership data shows a 57.4% homeownership rate in Orange County. Statewide homeownership has historically been about two percentage points below Orange County’s. The state average is currently 55%, thus homeownership reports in Orange County in 2017 will likely remain around 57%. Expect Orange County’s homeownership rate to remain at its present low level until 2021-2023, when the housing market will bounce back from the recession expected in 2020. Only with the return of jobs, higher wages and increased confidence will the first-time homebuyer population gain traction. However, don’t expect the rate of homeownership to fully return to the inflated heights seen in 2007 anytime soon. This rate was elevated by unfettered access to easy money, which mortgage regulators tamped down in 2014 with enforcement of ability-to-pay (ATR) rules to protect society from certain destabilizing types of mortgage lending. These rules limit mortgage funding to those homebuyers with the financial ability to actually repay their debts. Thus, the housing market won’t see a repeat of those Millennium Boom homebuyers who lacked the proper finances. Though this translates to a slightly lower homeownership rate in the near term, it fosters a more stable future housing market in Orange County and the state. The shift of Gen Y to rentals for a longer period before buying a home than in past generations also puts a cap on home sales volume. 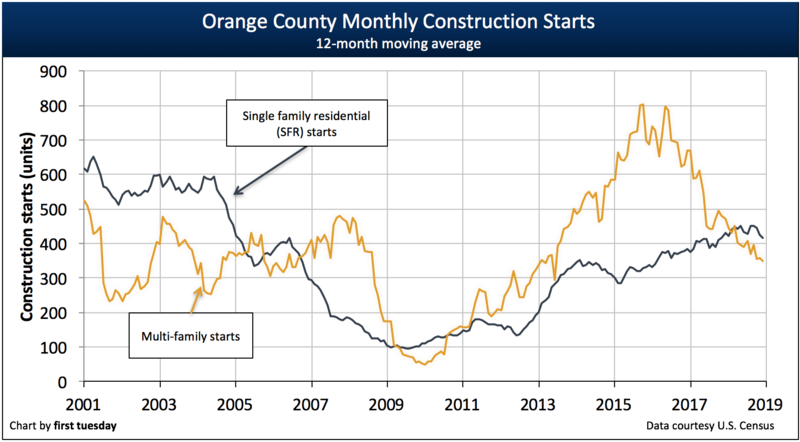 The recovery picture is mixed for Orange County residential construction. After years of increased single family residential (SFR) construction starts, 2018 saw a decrease in the number of new SFRs started. In total, 19% fewer SFR starts occurred in 2018 compared to the previous year. Multi-family starts in Orange County totaled 4,500 in 2017, decreasing about 6% from 2017. This downward trend in starts will likely reverse in the coming years, as legislative moves focus on adding more housing for the ever-growing resident population. On the other hand, don’t expect SFR construction to recover fully anytime soon. The next peak in SFR construction starts will likely occur in 2021-2023 as renters shift to becoming homeowners following a statewide-push for more construction. Even then, SFR starts are unlikely to return to the mortgage-driven numbers seen during the hyperactive Millennium Boom. California regained all jobs lost at the end of 2014, but Orange County didn’t catch up until the last quarter of 2015. 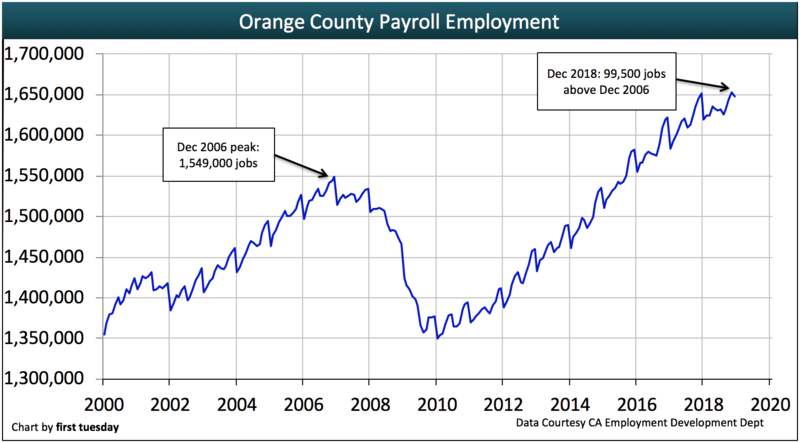 The number of employed individuals in Orange County has stalled just above 1.6 million in December 2018, as total job numbers actually declined in 2018, just 99,500 above the number of jobs held before the recession. However, since Orange County’s population has grown significantly since jobs previously peaked in 2006, the real recovery is still further down the line. As seen in Figure 9, job additions have been one-third slower to come about during this recovery compared to the 2000s recovery, and at half the pace of the 1990s recovery, echoing the secular stagnation of the 1930s. When will all of these jobs catch up with Orange County’s continuously growing population? Orange County will likely catch up in 2020, just in time for the housing market to hit a major obstacle as economic factors set up for the next recession, expected by forecasters to arrive in 2020. These factors include the mitigating effect on home sales and the jobs market of increased mortgage interest rates, which began in 2018. The number of individuals employed in the real estate and construction industries fell during the recession, beginning to show mixed improvement in 2012. 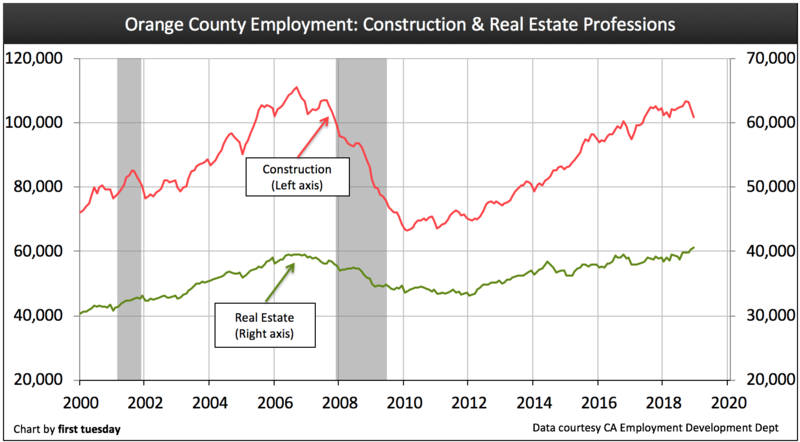 While the number of real estate professionals is now level with pre-recession levels, construction workers are still well below their Millennium Boom peak, and declining going into 2019. Jobs numbers in both of these industries will likely stall in 2019-2020, as sales slow and construction struggles to gain momentum. The average income earner in Orange County made $65,400 in 2017 (the most recently reported data from the Bureau of Economic Analysis). Sustainable home price increases (not driven by cash-heavy investors or market momentum) are limited to a ceiling set by personal income, the annual rate of increase from 2016 to 2017 in this region being 4.2%. These annual income and price increases will remain low until an optimal employment level is attained with a full jobs recovery for the 10%+ population growth since 2007. Orange County will likely achieve these job numbers in 2020. Meanwhile, price increases will remain low since homebuyer occupants ultimately determine selling prices — they can only pay as much for a home (or rent) as their savings and income qualify them to pay — nothing more for a sustained period of time. However, per capita income increases will likely slow somewhat in 2020-2021 following the 2020 recession. This, along with higher interest rates, will hold back home sales in the next few years. Look to 2021-2023 for the next significant increase in home sales volume and prices. This period will be driven by the shifting demographic trends of retiring Baby Boomers and their Gen Y children who will become homebuyers en masse following the next recession. We’ve had modest rises in home price appreciation so far. Jobs are strong, demand is strong. No crash coming as borrowers aren’t buying with fake income like back in 2007. It is verified. Orange County market is going to see a big crash and minimum 30% drop in value in 2017. It will become a buyer’s market as it was in 2010. Builders are building and property owners are selling higher than the new homes sales! It is time for a big change. 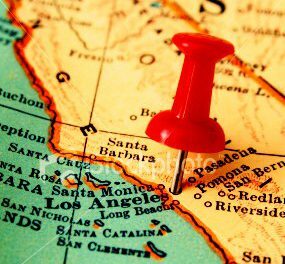 Orange County will remain a heavily demanded destination for home buyers. There is not going to be any drop in prices or increases in inventory. 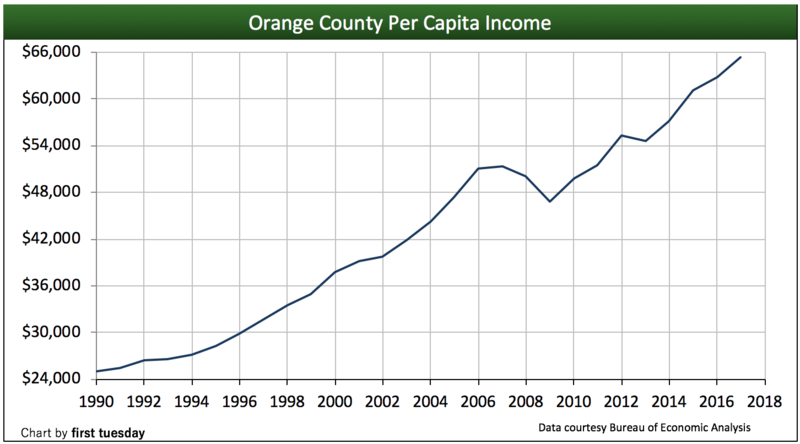 Where else are Orange County residents going to move and have the same benefits, nowhere. Also, the boomers are retiring and are going to have the freedom to enjoy more fully all the amenities available to them this location offers. My tenants are asking for multi-year leases, the first time since the recovery and so far I am keeping them at 1 year only. My advice if you are in the market to purchase grab something and lock in the still historically low interest rates available now. I hope it crashes and burns to the ground. After it does, im coming in strong and buying! Brun baby, burn!!! 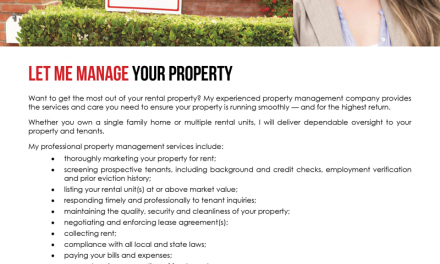 Turnover rates are likely to rise dramatically in the convergent 2019-2021 boomlet period raising rental vacancy rates. Then, members of Generation Y (Gen Y) will collectively first rush to buy but since their income and job security is considerably low they end up renting and housing market is going to crash sometimes between 2017-2020. This author is using a lot of definitive verbiage on the future. As an example, “Sales volume will bottom again in 2017 before rising continuously into 2019-2020.” Shouldn’t the word “likely” be in there somewhere, since the author is making a prediction based upon a range of possible outcomes and the future is inherently uncertain? Sam it’s. Common for analysts to use definitive language. It strengthens their prediction by showing they fully believe it and are not riding the fence by saying what it might do. Not correct. This is only one of many factors.